I’m all about self-development and have come to realize that the best way to become a better version of myself it to work on tracking my daily habits. Daily habits are the building blocks for everything else in our lives. Have you noticed this as well? Do you feel better about yourself, find you are more productive and happier when you are focusing on improving your daily habits – I know I do. I need all the help I can get in this area since I am naturally a bit of a slacker. My natural tendency is to take the path of least resistance. It drives me nuts and I want to be a better person – hopefully, none of you can relate. What I finally started doing is using a daily habit tracker. I know, it sounds totally dorky, but it makes a huge difference. Seeing my daily goals written out with a line of stars next to the days where I’m successful is the best feeling in the world. Daily habit trackers are particularly motiving when you’ve gone 8 days with positive results and you’re tempted to cheat on the 9th day. Looking at the boxes always seems to give me the strength to keep going. 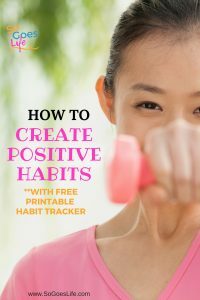 Download my Free Positive Habit Tracking Printable Worksheet to get started. I keep my daily habit trackers super, super simple. I get frustrated and fail miserably if I make things too complicated. This is pretty self-explanatory but start a list of habits you want to track. Start simple and focus on 2-3 areas of your life that need improvement. If you are trying to get into shape, track exercise goals or food consumption. If you are trying to save money, track no spending days. If you are trying to work on self-improvement track the days you read. Literally, the sky is the limit. If you are struggling to come up with some habits to track check out this list of trackable habits. You are welcome to download my habit tracking templates. They are super simple, and you can print as many copies as you need. If you are using a bullet journal you can easily create your own tracking forms by creating a grid. Personally, I recommend using a ruler or you are going to drive yourself nuts. Literally, all you do to create your habit tracking form is write a grid with the date on top and the habits you want to track on the side. If you are new to printable habit tracking I recommend starting out small. Choose 5-8 important habits you feel will give you the most bang for your buck. Write them down and then begin working on them. Once you feel comfortable with the first few habits, keep adding to your list. Before long you’ll have a nice long list of positive habits. 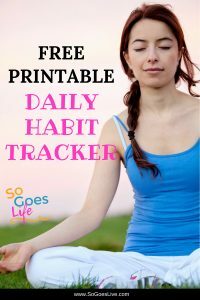 I also use the daily habit tracker to track negative habits. When I’m trying to stop doing something, it is a great way to track my poor habits. Lately, I’ve been trying to cut down on my sugar consumption. I hate to admit it, but tracking hasn’t helped me at all. Sugar is my weakness, but I know it will work eventually. Experts say it typically takes 66 days to form a new habit. I’m not sure I agree with this logic. I’ve found that some habits I can easily make in a few days, other habits take me years. Some habits are harder to create and break. Others are pretty simple. It all depends on your motivation and willingness to keep pushing forward. I think that the biggest way to guarantee successful completion of your goals is to track your daily actions. It is so motivating to see the results of your hard work. Even though I’m failing miserably at my sugar goal, I can still see the occasional successful days. When I see those days I can look back and see what I did differently and hopefully start doing better. I’ve found daily habit tracking most beneficial when I’m trying to incorporate small things into my daily routine. For example, I’ve been trying to exercise more consistently. My schedule has been crazy, so I set small individual exercise goals. One of my goals has been to do 120 lunges each day. It is such a small little thing, but I’m nailing this goal. Seeing my little-checked boxes gives me the incentive to work towards my goal each day. 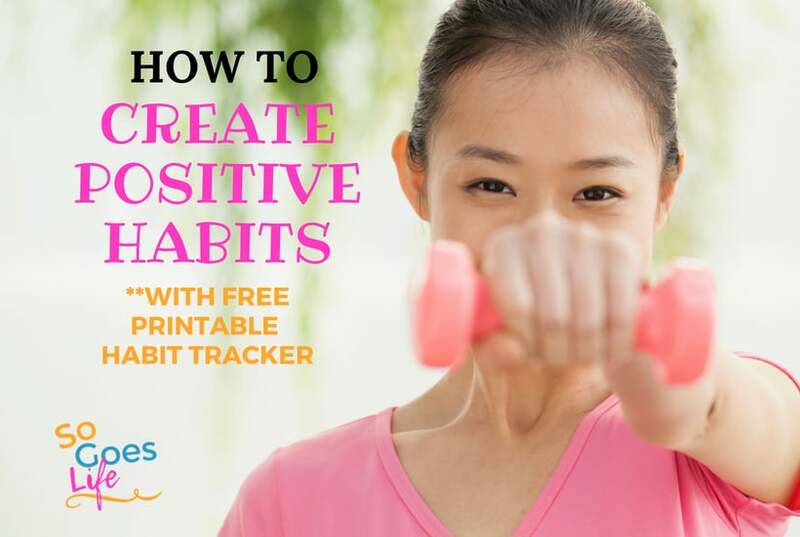 If you have struggled to achieve your goals in the past, try Tracking The Habits You’d like to change with this free printable that will help you achieve those goals. It won’t always be easy, but it will work.